Optimization of the customer experience carries with it a plethora of opportunities and challenges for an organization. One challenge is managing omni-channel communication with customers, which savvy service organizations leverage to manage customer conversations to reduce friction for their customers and outpace their competition. In fact, 51 percent of companies surveyed by Aberdeen use at least eight channels to interact with customers. Service organizations with a mobile workforce use a variety of scheduling solutions for field service scheduling on a scale ranging, from completely manual to totally optimized. While transitioning to a fully optimized solution takes effective change management and investment, the benefits can be an organization's differentiating factor. In order to achieve true digital transformation companies need to carefully evaluate how they employ field service technologies like IoT, artificial intelligence, and mobile. Download today and ensure you are selecting the appropriate field service tools for your needs. To ensure you are setting your organization up for success, take any new technology purchase and evaluate it through this lens. There are several reasons service organizations launch a process to evaluate, purchase and implement new field service management (FSM) software. Selecting a new FSM software can is a big decision for your organization, and choosing the best one for your company is critical. This white paper covers common reasons for launching an FSM software evaluation . Robots Replace Advisors: Fact Or Fiction? Visit any typical contact center today and one thing is constant: the sheer number of people involved. Visit any modern warehouse and by contrast automation dominates the working environment. Will contact centres follow suit? 2019: Navigate Ever-Increasing Customer Demands In An Evolving Service Landscape. Infomill, Inc., developers of the AnswersAnywhere™ Knowledge-as-a-Service, today announced that BUNN® - global leader in commercial beverage equipment – has deployed an AnswersAnywhere product knowledge base to boost customer satisfaction and field service efficiency. 04.22.19 -- Is It Time For You To Consider A Remote Expert Solution For Your Team? 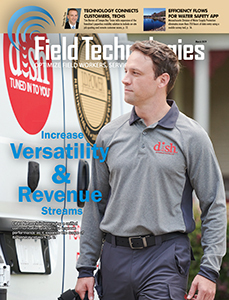 Field Technologies Online is the premier resource for the optimization of your field workers, service, and assets. Our goal is to provide companies in the field service, transportation/distribution, government, public works, and utilities industries with information on mobile technologies that can be used to improve productivity and drive efficiency. Here you’ll find valuable resources on topics including field service software, mobile computing, fleet and asset management, and M2M. From real world, firsthand accounts of how your peers are using mobile technologies to drive business benefits to thought leadership on the latest technology advancements and trends; Field Technologies provides the information you need to determine how mobile technology could be improving your organization. Please take a moment to join our community and discover the benefits of your free membership. If you have feedback, we’d love to hear it – please email us at info@fieldtechinfo.com.